Merry Christmas Eve!! My favorite holiday is finally here tomorrow and I couldn’t be more excited about it. We’ll be having a pretty typical Christmas day: wake up, eat a big feast of a breakfast, then open gifts! After spending the morning and early afternoon at home, we’ll head to our family friend’s house for another fun party. That’s what I love about the holidays, there’s always a celebration! I wore this Morgan Carper dress for my sister’s 30th birthday dinner a little over a week ago and may wear it again for Christmas Eve dinner – it’s just such a pretty number for a special night like tonight. The gold brocade skirt is so festive, but not loud. It’s also an ideal choice for NYE! I found this statement chain belt by Sophie Hulme in NET-A-PORTER’s sale and thought it would add a fun element to the look – I’d love to try belting a blazer or coat with it soon! If you’re still looking for something fabulous and sparkly for New Year’s Eve, take a peek at these: for a more formal affair I’d choose this eye-catching Badgley Mischka beaded number, for bar hopping layer this sequin tank (or this one!) 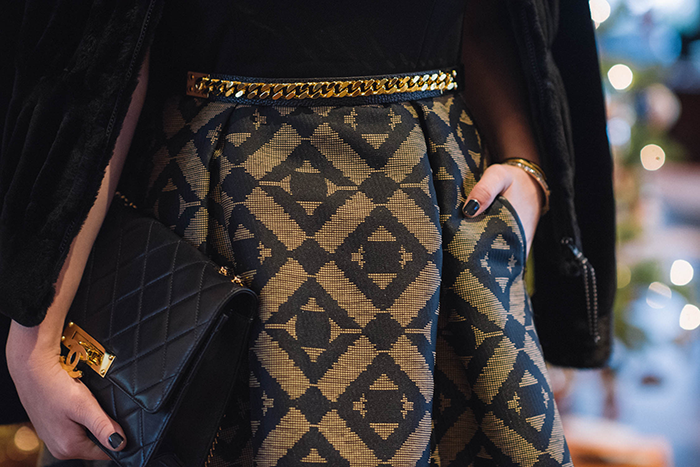 under a leather jacket, or for a house party try this sequin skirt with an oversized sweater. If you’re on a budget, check out this embellished LBD, this winter white sequin sheath, and this Milly mermaid sequin frock – all of these are under $200! Buy today and get it before the parties start. I hope all of you enjoy the Christmas holiday – much love to you and yours! This look is so beautiful! I love the belt! Your/ or your sister’s Christmas tree is stunning!Merry Christmas to you! That skirt is stunning, love this outfit. Great skirt! Nice tree too. Merry Christmas! wow,very gorgeous Christmas,and the dress is also very chic and charming, are you going to attend your parties? Gorgeous! I love the black and gold. Such a classic combination. Ooh I seriously love your dress!! I love this outfit! Great for a holiday party!